After the rainy summer we've had, what a relief it has been to step into sunny, hot August! These are the perfect days for swimming, boating, and running around outside. Water is an integral part of our play around here. 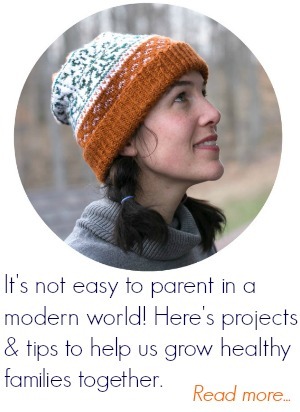 Whether it's helping Mama with dishes, playing with the hose, or- their most favorite of all- water experiments. 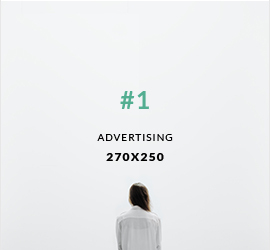 This is a simple one, with only chalk and spray bottles. I'm borrowing pictures from last summer so enjoy the younger-looking kids! This experiment started with some rocks borrowed from our yard. 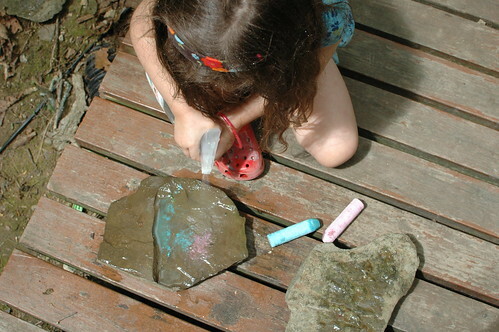 We first experimented with drawing on dry rocks, this sidewalk chalk, versus drawing on wet rocks. 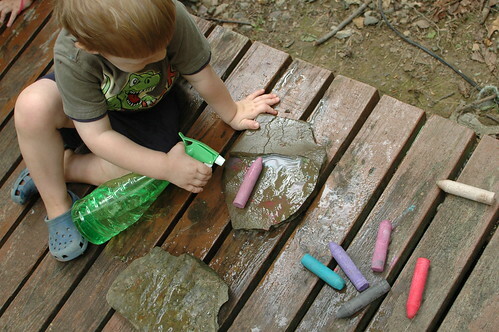 We used our spray bottles to wet the rocks, which helps to build up little hand muscles too. 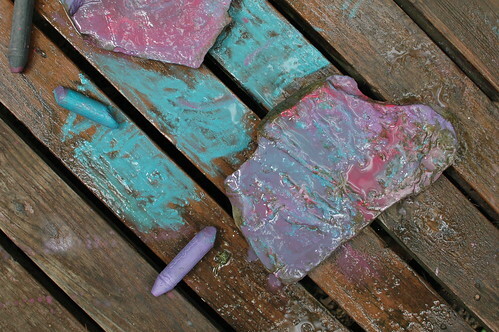 Then we kept drawing and spraying on the rocks. The colors start to really blend and float together, especially when we kept drawing on top of the water. So beautiful! and realized the outlines were being left behind! 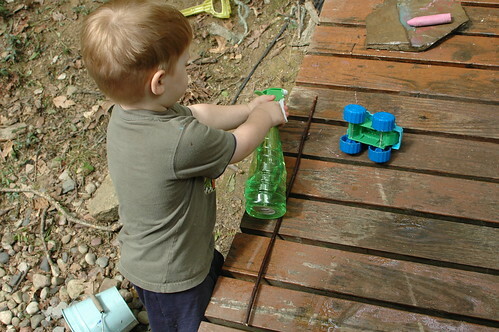 So that was the rest of our play, gathering objects from the yard and spraying them to compare their outlines. 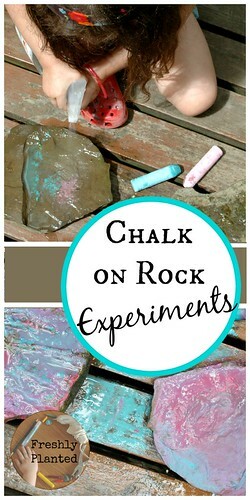 *In the chalk & water experiment, kids are actually learning about dissolution. Although the water is carrying the chalk particles, it is not actually dissolving them. 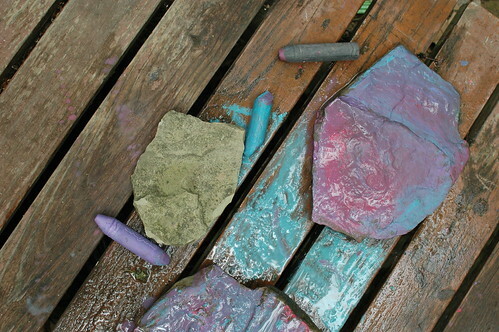 As the water evaporates, the chalk will remain the same on the rock. 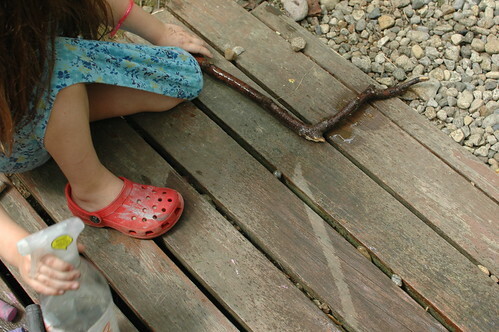 *If you have fresh rainwater available- compare spraying with rainwater vs. spraying with tap water. 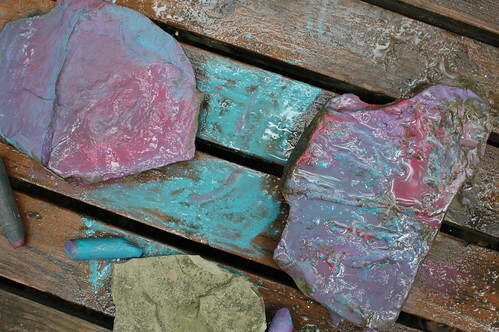 The rainwater is slightly acidic and should break down the chalk more. 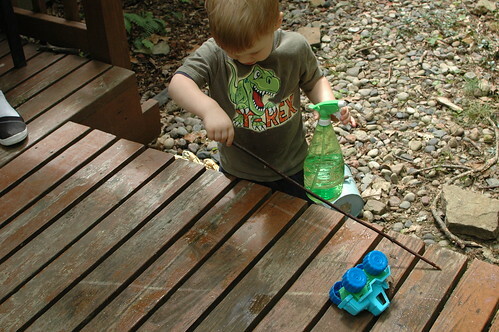 *Spraying water onto objects, then studying their outlines, helps little ones realize each object has a different shape. Since shape is an element of art, this is a great casual way to begin exploring it together and helps to set a good foundation for drawing later. 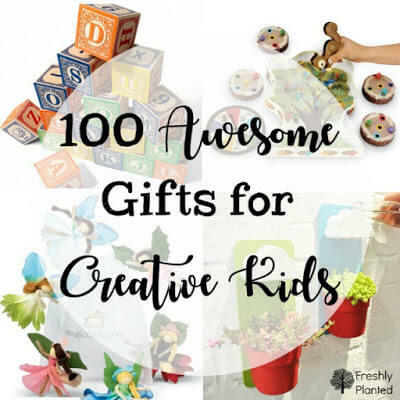 What a lovely and fun activity for your little ones. I love the way the rocks looked afterwards too! So pretty!